Shallow mangrove-lined creeks provide the best jack fishing but they are often taken from bottom structure such as snags and rock-bars in saltwater rivers and estuaries. 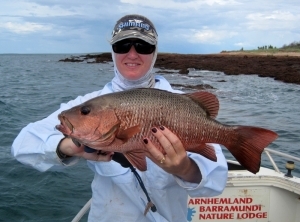 Fish caught in the creeks and rivers rarely weigh more than 1kg but larger specimens up to 10kg are sometimes caught along the coast and on offshore reefs. Other Names: Lutjanus argentimaculatus. Red bream, jack. Location: In mangrove-lined saltwater creeks and offshore reefs. Method: Baitcaster or threadline outfits in the 4kg to 8kg range. Jacks will take a variety of lures with small, diving, minnow-style lures taking most fish. Lures need to be cast close to snags and rocks to entice a strike from the jack and then it’s a matter of keeping them out of their lair. Eating: Like most members of the Lutjanus family, the jack is an excellent table fish with white, firm flesh with fine flakes and little oil. The flesh of very large specimens may be a bit dry.